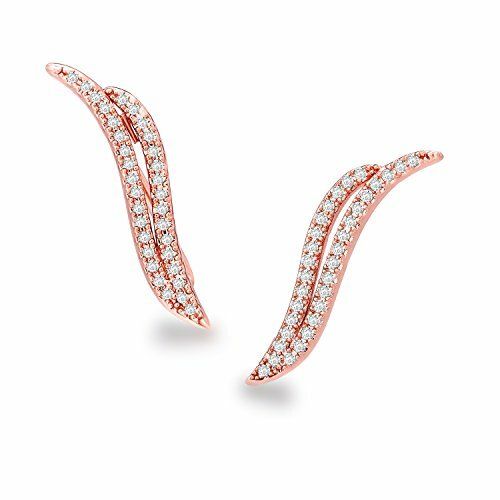 Quality - Eco-friendly brass plated with 14k rose gold. Hypoallergenic and resistant to color fading and tarnishing. Stylish - These climbers have a modern, sleek look, quickly become the attention grabber with a very subtile edgy flair. They are simple, elegant, and edgy yet so shiny that they stand out immediately. They can complement almost any outfit for any occassions. Gift - Packed in a gift box. Ready for gifting to a loved one such as girlfriend, lover, fiancee, wife, mother, daughter, granddaughter, sister or just a friend. Lovely for any special occasion including birthday, graduation, Valentine, anniversary, Mother's Day, Christmas, Thanksgiving, Easter, etc. Satisfaction - 30-day money back gurantee.